Helicobacter pylori is a Gram-negative bacterium that has been linked to peptic ulcer disease, gastric lymphoma, and gastric carcinoma. Apart from its well-demonstrated role in gastroduodenal diseases, some authors have suggested a potential role of Helicobacter pylori infection in several extra-intestinal pathologies including haematological, cardiovascular, neurological, metabolic, autoimmune, and dermatological diseases. Some studies suggest an association between Helicobacter pylori infection and skin diseases such as chronic idiopathic urticaria and rosacea. There have also been few case reports documenting association between Helicobacter pylori and psoriasis vulgaris, Behçet’s disease, alopecia areata, Henoch-Schönlein purpura, and Sweet’s syndrome. However, more systematic studies are required to clarify the proposed association between Helicobacter pylori and skin diseases; most of the studies do not show relevant relationships of these diseases with Helicobacter pylori infections. This review discusses skin diseases that are believed to be associated with Helicobacter pylori. Gastric colonisation by HP is accompanied by production of large quantities of various pro-inflammatory substances such as cytokines, eicosanoids, and acute-phase proteins. This inflammatory response may lead to the development of antigen-antibody complexes or cross-reactive antibodies (by molecular mimicry) resulting in damage to other organs. In addition, increased permeability of the gastric and intestinal mucosa in infected patients may result in increased exposure to alimentary antigens. The key pathophysiological events in HP infection include initiation and continuance of an inflammatory response.4 6 10 Helicobacter pylori strains have been divided into types I and II. Type I strains express cytotoxin-associated antigen (CagA) and vacuolating cytotoxin antigen (VacA), whereas type II strains do not express any antigens.7 Helicobacter pylori infection is associated with mucosal inflammation due to infiltration by neutrophils and monocytes in the gastric mucosa. Urease, catalase, protease, lipase, and phospholipase are produced by HP, and these enzymes may be involved in the pathogenesis of gastric inflammation.11 Translocation of CagA into the gastric epithelial cells leads to increased levels of pro-inflammatory cytokines such as tumour necrosis factor–α, interleukin (IL)-6, IL-10, and IL-8. The VacA protein interacts with macrophages, B- and T-lymphocytes and causes reduced IL-2 production with resultant suppression of IL-2–mediated T-lymphocyte proliferation. The interaction between HP and B-lymphocytes results in uncontrolled growth and proliferation of predominantly CD5+ B-cells that produce polyreactive and autoreactive immunoglobulin (Ig) M and IgG3 antibodies. The antibodies produced do not result in clearance of the pathogen and may result in further production of autoreactive antibodies, such as anti-H/KATPase antibodies. These autoantibodies have been implicated in the development of gastric atrophy.12 Franceschi et al13 found an epidemiological link between CagA- and VacA-positive HP strains and idiopathic dysrhythmias in a study with 54 dysrhythmic patients. The results of studies investigating HP seropositivity in skin diseases and the effect of eradication therapy (amoxycillin and clarithromycin in triple therapy) are conflicting. Helicobacter pylori infection triggers a marked local inflammatory response and a chronic systemic immune response. It is possible that inflammatory mediators released during the immune response to HP infection may play a role in the pathogenesis of skin diseases. Helicobacter pylori eradication may result in total or partial remission of clinical symptoms in at least some cases of skin diseases with itching. There are also some studies in which certain patients achieved complete remission after successful eradication with appropriate treatment. Helicobacter pylori eradication has no effect on psoriasis, and there is no exact evidence of an association between HP infection and psoriasis. In addition to this, eradication therapy is not always effective for treating chronic urticaria.7 14 Thus, long-term, randomised, placebo-controlled systematic studies on the potential effects of HP eradication in patients with skin diseases are needed. In this review, skin diseases that are thought to be associated with HP and the results of eradication therapies will be discussed. The results of studies investigating HP prevalence in patients with chronic urticaria and the effect of eradication are conflicting. Fukuda et al21 performed a study to assess the prevalence of HP infection and effect of bacterial eradication on skin lesions in patients with CIU (n=50). They found that 52% of the patients (n=26) with CIU were HP-seropositive, while 48% of the control subjects were HP-seropositive (statistically non-significant). Of the 26 patients with CIU infected with HP, 19 received eradication therapy, and eradication was successful in 17 of them. Of these 17 patients, six (35%) had complete remission and 11 (65%) had partial remission. On the other hand, of the nine patients without HP eradication, only two (22%) showed partial remission and seven (78%) had no improvement.21 According to this study, eradication of HP would be a valid choice for the treatment of CIU if patients were infected with HP. Moreira et al24 evaluated 21 patients with CIU using 13C-UBT. Triple therapy (amoxycillin, clarithromycin, and omeprazole) were given to infected patients for 7 days. The results of therapy were assessed by 13C-UBT 1 month after therapy. Urticaria and gastro-intestinal symptoms were assessed on enrolment and for 6 months after eradication. Prevalence of HP infection was 71% (15/21); HP eradication rate was 86% (12/14). Three patients had clinical improvement with total resolution of urticaria, starting immediately after eradication therapy. In a cohort of 42 patients with CIU, Di Campli et al16 found that 55% were infected by HP; 88% of infected patients, in whom the bacterium was eradicated after therapy, showed a total or partial remission of urticaria symptoms. Conversely, symptoms remained unchanged in all uninfected patients. According to this study, HP eradication was associated with remission of urticaria symptoms, suggesting a possible role of HP in the pathogenesis of this skin disorder. Daudén et al26 evaluated 25 patients with chronic urticaria using 13C-UBT to find a 68% prevalence of HP infection; this value did not differ from that in the general population. After eradication therapy, only one patient showed complete remission of urticaria and two patients showed partial remission. These results support a lack of relationship between HP infection and the course of CIU. There are many studies in the literature showing the interactions between HP and chronic urticaria. However, the results of studies investigating HP prevalence in patients with urticaria and the effect of eradication are conflicting. For this reason, more randomised and case-control studies are necessary to prove an association between HP and CIU. Thus, many studies have suggested that HP is involved in the aetiology of rosacea, at least as a triggering factor, and that eradication treatment provides symptomatic relief. Mytinger et al49 reported a 13-year-old boy with HSP associated with HP infection. Treatment of the HP infection was accompanied by prompt resolution of the HSP. Alopecia areata is a disease of the hair follicles, with strong evidence supporting an autoimmune origin, although the exact pathogenesis of the disease is not clear.50 It affects 1% to 2% of the population,5 and occurs in all ethnic groups, ages, and both sexes.51 The pattern of hair loss can vary and can affect any part of the body. Alopecia areata frequently occurs in association with other autoimmune diseases such as autoimmune thyroiditis, lichen planus, psoriasis, Sjögren syndrome, and idiopathic thrombocytopenic purpura.50 Abdel-Hafez et al51 compared 31 patients with AA and 24 healthy volunteers of similar gender ratio for the presence of HP surface antigen (HpSAg) in stool. Optical density values for HP infection were positive in 18 (58.1%) of all 31 patients evaluated, while these were negative in 13 (41.9%) patients. In the control group, 10 (41.7%) of 24 yielded positive results. Although the mean HpSAg level was higher in the AA group, the difference was not statistically significant. This study did not support the relationship between HP and AA.51 Campuzano-Maya50 reported the case of a 43-year-old man with an 8-month history of AA of the scalp and beard areas. He had a history of dyspepsia and the UBT confirmed HP infection. The patient went into remission from AA after HP eradication therapy. This association, however, must be confirmed with epidemiological studies.50 Rigopoulos et al52 also reported no increased prevalence of HP infection in patients with AA. Sweet’s syndrome, or acute febrile neutrophilic dermatosis, is characterised by the acute onset of fever, leukocytosis, and erythematous plaques infiltrated with neutrophils. It has been associated with inflammatory and neoplastic diseases, but most cases are idiopathic. An association between HP and Sweet’s syndrome has been proposed. Kürkçüoğlu and Aksoy53 reported a 42-year-old woman with Sweet’s syndrome. Her endoscopic biopsy specimens from gastric mucosa disclosed chronic active gastritis and showed HP organisms. After eradication therapy, the skin lesions subsided. New case reports and clinical trials are necessary to confirm this association. Although some studies have shown that HP has a role in the pathogenesis of some dermatological diseases, it is not known whether HP is a trigger or the causative agent for the disease. The results of studies investigating HP seropositivity in skin diseases and the effect of eradication are conflicting. For this reason, systematic studies examining the relationship between dermatological entities and infection with HP, and documentation of the effect of HP eradication are needed to further our understanding on this topic. 4. 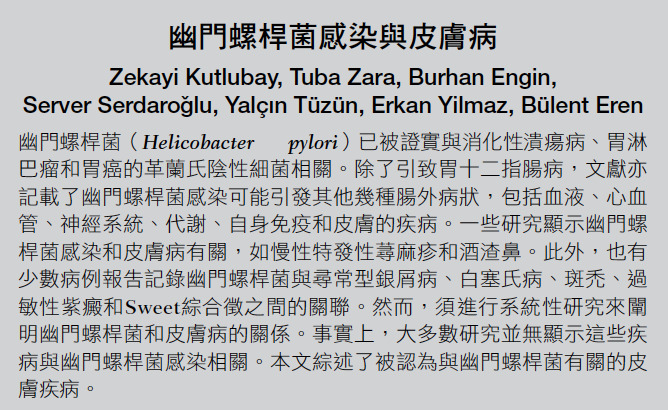 Kutlubay Z, Karakus O, Engin B, Serdaroğlu S, Tüzün Y. Helicobacter pylori infection and skin diseases. In: Manfredi M, de’Angelis GL, editors. Helicobacter pylori: detection methods, diseases and health implications. New York: Nova Science Publishers; 2013: 323-35. 6. Hernando-Harder AC, Booken N, Goerdt S, Singer MV, Harder H. Helicobacter pylori infection and dermatologic diseases. Eur J Dermatol 2009;19:431-44. 15. Kocatürk E, Kavala M, Kural E, Sarıgul S, Zındancı I. Autologous serum skin test vs autologous plasma skin test in patients with chronic urticaria: evaluation of reproducibility, sensitivity and specificity and relationship with disease activity, quality of life and anti-thyroid antibodies. Eur J Dermatol 2011;21:339-43. 18. Sianturi GN, Soebaryo RW, Zubier F, Syam AF. Helicobacter pylori infection: prevalence in chronic urticaria patients and incidence of autoimmune urticaria (study in Dr. Cipto Mangunkusumo Hospital, Jakarta). Acta Med Indones 2007;39:157-62. 30. Del Rosso JQ. Advances in understanding and managing rosacea: part 1: connecting the dots between pathophysiological mechanisms and common clinical features of rosacea with emphasis on vascular changes and facial erythema. J Clin Aesthet Dermatol 2012;5:16-25. 40. Qayoom S, Ahmad QM. Psoriasis and Helicobacter pylori. Indian J Dermatol Venereol Leprol 2003;69:133-4. 41. Fabrizi G, Carbone A, Lippi ME, Anti M, Gasbarrini G. Lack of evidence of relationship between Helicobacter pylori infection and psoriasis in childhood. Arch Dermatol 2001;137:1529. 42. Fathy G, Said M, Abdel-Raheem SM, Sanad H. Helicobacter pylori infection: a possible predisposing factor in chronic plaque-type psoriasis. J Egypt Women Dermatol Soc 2010;7:39-43. 43. Onsun N, Arda Ulusal H, Su O, Beycan I, Biyik Ozkaya D, Senocak M. Impact of Helicobacter pylori infection on severity of psoriasis and response to treatment. Eur J Dermatol 2012;22:117-20. 47. Ersoy O, Ersoy R, Yayar O, Demirci H, Tatlican S. H pylori infection in patients with Behcet’s disease. World J Gastroenterol 2007;13:2983-5. 50. Campuzano-Maya G. Cure of alopecia areata after eradication of Helicobacter pylori: a new association? World J Gastroenterol 2011;17:3165-70.